Why do I say y’all? I was in Chattanooga all weekend visiting my mom and dad! We had such a good time and enjoyed every minute of my family and the beautiful scenery. It was amazing and the people were even more amazing. It was Ellie’s first airplane ride and she did amazing too! It was the first time she cried (sobbed really), when leaving her “mamie” and “papa”‘s house and it broke all of our hearts and made us cry a little harder. As we were taking off, she looked out the window and said softly, “bye bye mamie and papa”. Until about a year ago, I never liked ribs. In fact, I didn’t like any kind of BBQ rib or pork. To me, the existence of Famous Dave’s or Smoky Bones was unthinkable. How does a restaurant that makes its livelihood on ribs or BBQ pork-like concoctions even keep afloat? I just hadn’t had the perfect rib yet. My mama and gramma made ribs growing up and they were indeed yummy. It wasn’t the recipe, it wasn’t the cook, it was me. 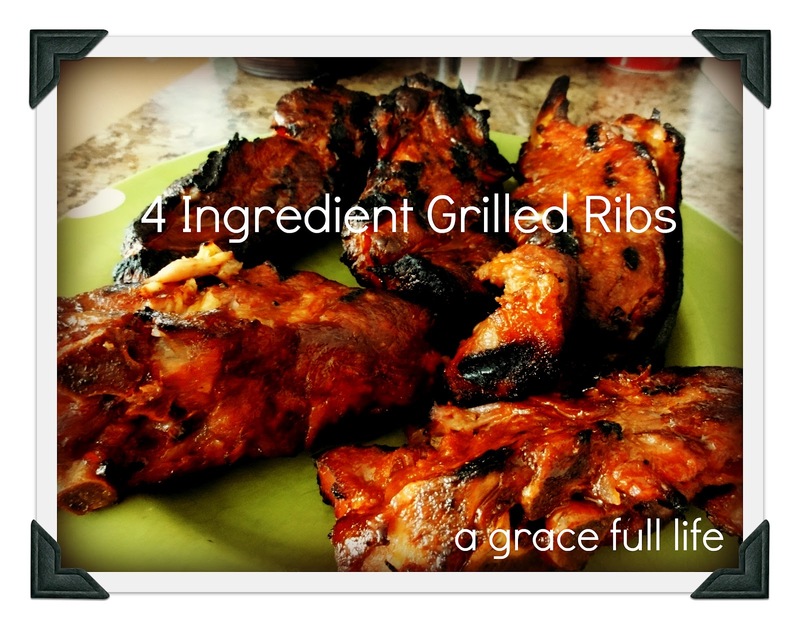 Until last year when my friend Rebecca told me about this great rib recipe that is so good, it would make even me, the ultimate rib hater swoon. Four-ish Ingredients and easy to make. Get a large stockpot and put ribs, sauce, onion, and spices into the pot. Add enough water to cover the ribs. After coming to a boil, boil on medium-high for an hour. Then take off heat and transfer to the grill. Grill on an oiled grill for 20 minutes until brown and crispy outside. It will be tender inside and caramely and sweet on the outside. It is insane how good these taste. You will love this so much and it is so easy to make. And they are that good. The best ribs you will ever eat! Get a large stockpot and put ribs, sauce, onion and spices into the pot. Hi! It is the best and easiest recipe! Glad you enjoyed it. I LOVE ribs. With a passion. If we go to an all you can eat buffet, I load up on ribs. Thanks for yet another awe.some recipe bestie! Kari – thanks for sharing these at the what's shakin' link party … I'm featuring these tomorrow!! Yay!! Thanks Keri! I can't wait to see it! I love your story! what a wonderful time you had! And Thanks for sharing this great recipe at the What’s for Dinner party! Hope your week is Amazing! Thank you so much! Have a great week as well!